Art Deco handmade platinum mount diamond ring circa 1920. The center is fistail prong set with a center round European cut diamond grading VS2 clarity J color. The surrounding mount is bead set with four baguette cuts and 32 single cut diamonds totaling approx. .50 cts. Size 5 and can be sized. Art Deco handmade platinum engraved mount band. 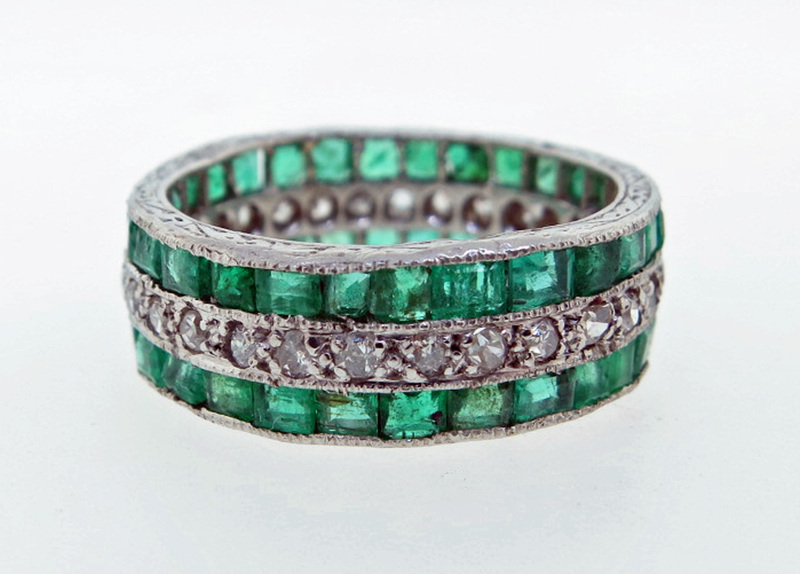 Channel set with 54 square faceted natural emeralds and 30 round diamonds .The ring is circa 1920 size 6 1/2. 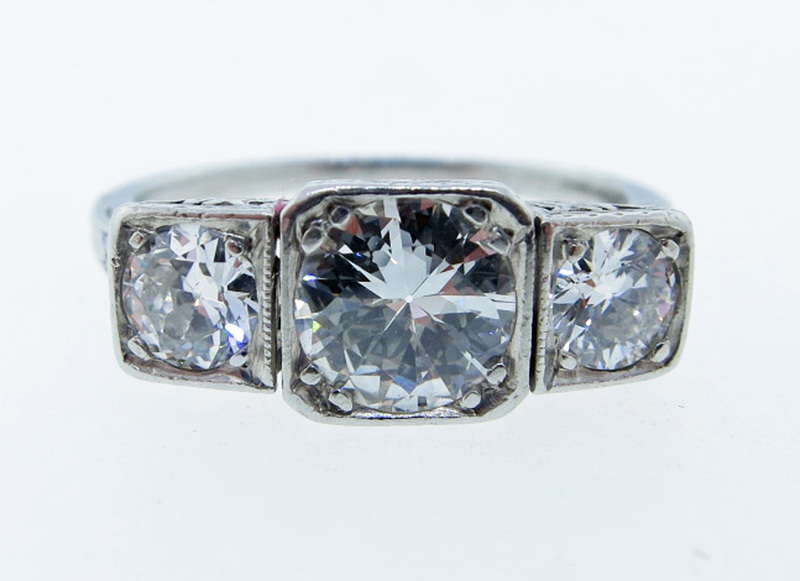 Antique platinum mount diamond ring. The center is set with a round European cut diamond weighing approx .78 cts. grading I color Vs clarity. Each side is set with a half moon shape diamond and 22 round diamonds totaling approx .75 cts. The ring is size 6 1/2 and can be sized. circa 1920. Unique design diamond Art Deco ring set with three round European cut diamonds at the top totaling approx .50 cts. The mount is accented with 37 rose cut diamonds. The ring is size 6 1/4 circa 1920. 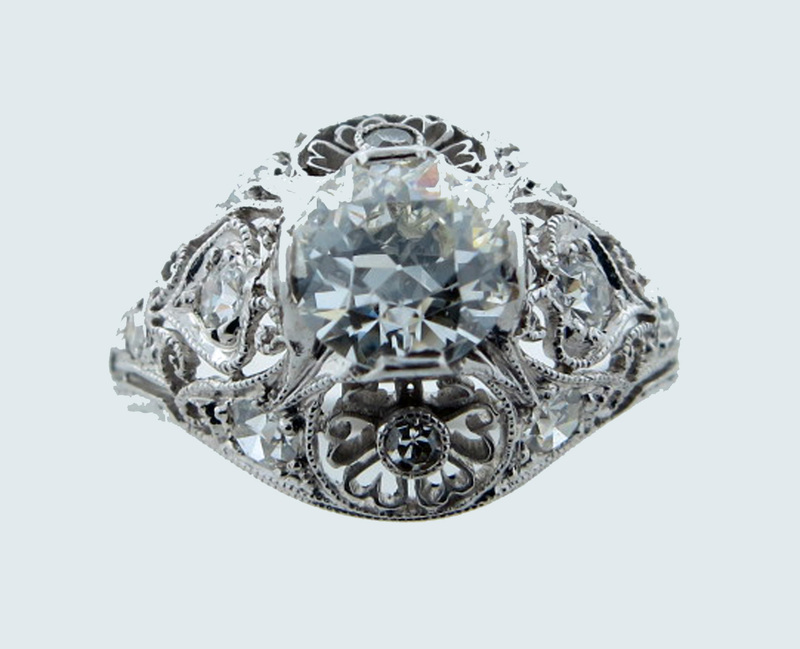 Platinum mount engagement ring prong set in the center with a round brilliant cut diamond weighing approx .65 cts. grading G-H color Vs clarity. Each side of the split shank is bead set with 7 round diamonds totaling .25cts. The ring is size 6 1/2 and can be sized circa 1950. Handmade scroll design platinum mount diamond ring..The center is prong set with a round brilliant cut diamond grading VS clarity I-J color. Each side of the shank is bead set with three slightly tapering diamonds totaling approx .55 cts. The ring is size 5 1/2 and can be sized. Glorious sapphire and diamond ring. The center is prong set with an emerald cut natural sapphire weighing approx. 4.38 cts. 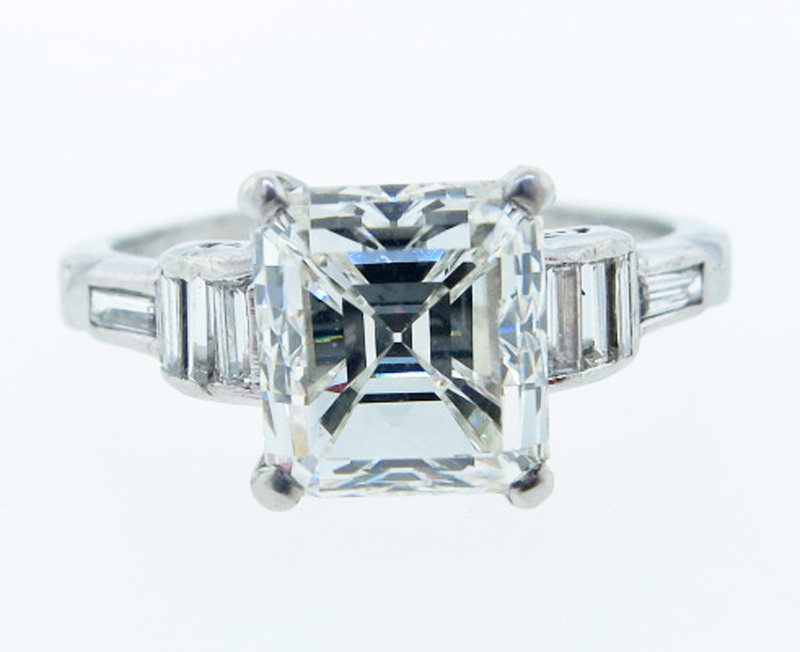 Each side is prong set with an emerald cut diamond totaling approx .90 cts. The ring is size 5 and can be sized. Lovely Art Deco handmade platinum open work mount ring circa 1925. The center is bead set with an old European cut diamond weighing approx .60 cts. grading J color VS clarity. The ring is size 5 1/2 and can be sized. Antique 14 kt. diamond ring in a cluster design circa 1900. 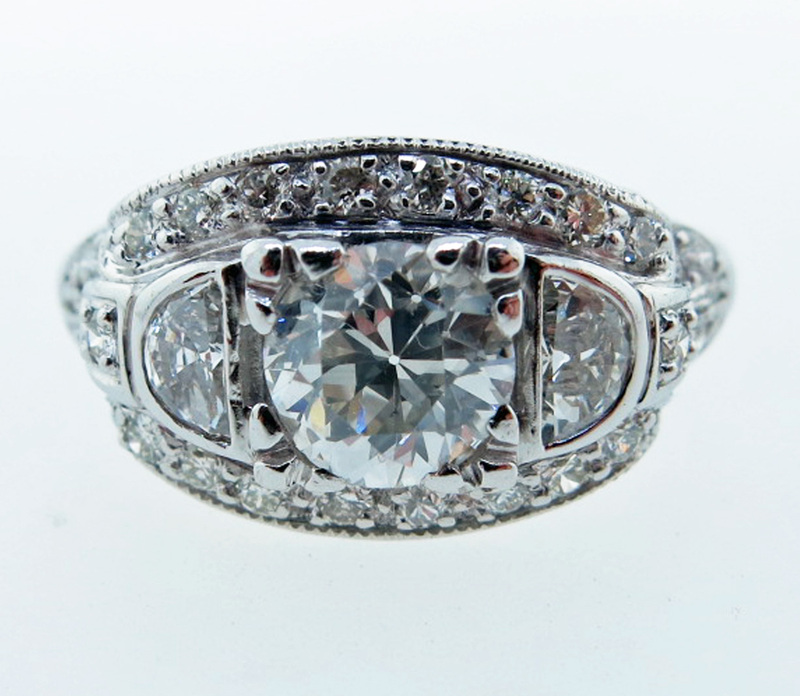 The center is bezel set in white gold with an old European cut diamond weighing approx. 38 cts. grading VS clarity H-I color . Surrounding the center are 13 bead set diamonds totaling approx .30 cts. The ring is size 6 1/2 and can be sized. Platinum hand engraved mount diamond ring circa 1925. The center is prong set with a round European cut diamond weighing 1.55cts. grading VS1 clarity J color. The corners of the engraved mount is bead set on each corner with round European cut diamond and a baguette cut emeralds. The ring is size 6 1/2 and can be sized. Handmade platinum mount period Art Deco diamond ring. The center is prong set with a round European cut diamond weighing approx .65 cts. grading VS clarity I color. The open platinum mount with heart shape sides are bead set with ten round accent diamonds. The ring is circa 1925 size 5 and can be sized. Handmade mount diamond ring in platinum. The center is set with an excellent cut marquise diamond, weighing approx 1.1 cts and grading E-F color VS clarity. The mount is set with four tapered baguette cut diamond totaling approx .35 cts. The ring is size 6 1/2 and can be sized. Handmade sophisticated platinum mount diamond ring. The center is prong set with a G.I.A. report emerald cut diamond weighing 2.1 cts. H color Vs1 clarity. Each side of the shank is set with three baguette cut diamonds. The ring is circa 1950 size 5 and can be sized. 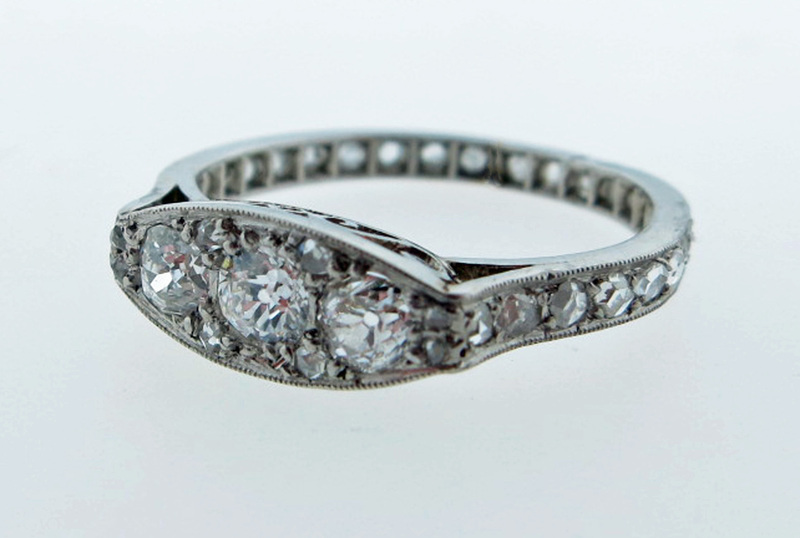 Ladies platinum mount diamond ring in a stylish 1950's design. The center is prong set with a marquise cut diamond weighing approx .55 cts. the leaf design mount is set with two marquise cut diamonds, eight graduating baguette cut diamonds and six round brilliant cut diamonds totaling approx 1.2 cts. grading VS1 clarity F-G color . The ring is size 8 and can be sized. 14KT. yellow gold mount Victorian ring. The center is prong set with an old mine cut diamond weighing approx .55 cts. grading VS clarity I color. The ring is circa 1880 size 5 1/2 and can be sized. Beautiful handmade platinum mount diamond ring made by the prominent Rhode Island jewelry firm Hutchison & Huests. The center is bezel set with a round European cut diamond weighing approx. 1.55cts. grading Vs clarity j color. The pierced open work mount is bead set with 16 round old cut diamonds totaling approx. .50cts. The ring is size 6 1/2 and can be sized. Circa 1925. Platinum mount five stone ring. The center is box set with a round European cut diamond weighing approx .55 ct. each side is set with two round European cut diamonds totaling approx .45 cts. grading VS clarity I-J color. The ring is size 6 1/2 and can be sized. 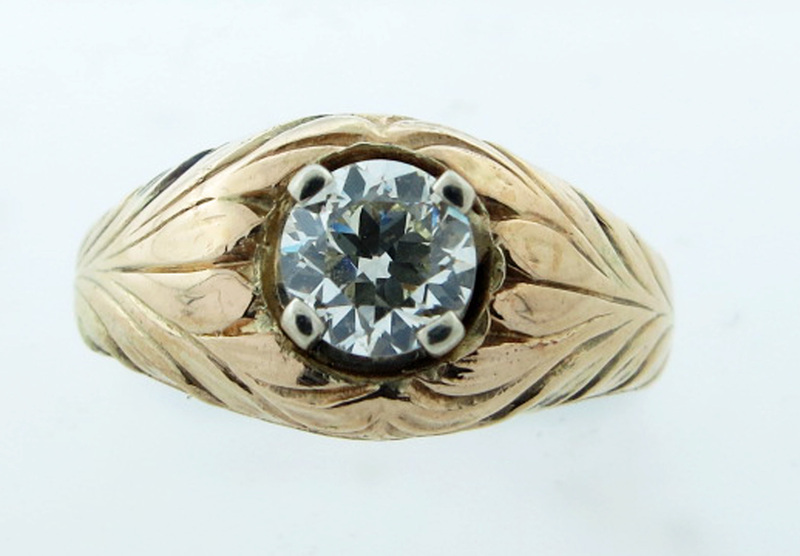 Antique diamond ring circa 1880. The center is set with a European cut diamond weighing approx .65 cts. grading VS clarity J-K color. The ring is size 7 1/2 and can be sized. Ladies 14kt. yellow gold hand engraved mount ring circa 1880. The center is prong set with an old mine cut diamond weighing approx .56 cts. grading VS clarity J color. The ring is size 5 1/2. Open work platinum mount Art Deco diamond ring. The center is bead set with a .60 ct. old European cut diamond grading VS clarity H-I color. The pierced filligree mount is bead set with ten round European cut diamonds and accented with eight French cut natural sapphires. Circa 1925. The ring is size 61/2 and can be sized. Scintillating antique 18 kt. yellow gold old mine cut diamond ring. Prong set with eight diamonds in a flower cluster design totaling approx .85 cts. grading VS clarity G-I color. The ring is circa 1880. size 6 1/2 and can be sized. Ladies diamond top ring in 18kt. yellow and white gold. The three European cut diamonds are basket set in white gold. Total diamond weight approx .75.cts. grading VS clarity K-L color. The ring is size 7 and can be sized circa 1910. 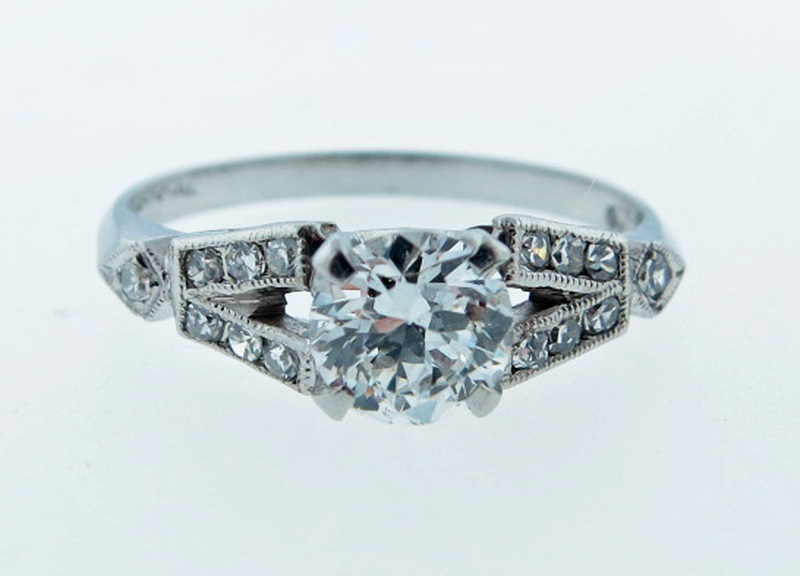 Beautiful open work platinum diamond ring circa 1925. The center is prong set with a round European cut diamond weighing approx .75 cts. grading VS clarity I color. The open work mount is bead set with twenty eight round accent diamonds and two triangular cut emeralds. Size 6 and can be sized .Exceptional condition !